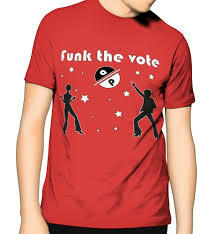 Dance Par-Tay (Funk The Vote Version) on DustyRadio Valencia Podcast! Part of the Funky Resistance is using all tools possible to make this country funky again, and the vote is one of those tools. Those who feel voting is uncool have seen the effect throwing away their vote has had in the past decade. This very funky podcast hopes to motivate and rejuvenate in anticipation of November. Come join the Booty Party — OHHHHHHH YEAHHHHHH!!! !